STEWARD & Co Freehold owned by Steward, Patteson & Steward. Fine Wednesday 16th March 1859 of 20s and costs for selling out of hours - see opposite. A former licensee at the door? Christopher Cossey, previously at the BARLEY MOW and before that at the STAR INN , advised that he had taken the house 19th November 1791. Advertised To Let, 26th August 1797, in occupation of Christopher Cossey, the owner, who was to retire. For Sale By Auction Wednesday 22nd September 1813. A desirable and well-frequented Inn. In the occupation of Thomas Cossey who would deliver possession at Michaelmas 1813.... but seemingly remained there until shortly before his death in 1820. All persons to whom the late Thomas Cossey stood indebted to at the time of his decease were requested to send their accounts to Millard & Murray, Solicitors, March 18th 1820. Address as Orford Hill in 1830. On Saturday 23rd March 1833, William Ward, a person of respectable appearance and connection, a dealer in hardware, "put a period to his existence by hanging himself" in a lodging room at the Star & Crown. Listed in S&P documents as formerly the CROWN & STAR and as having been first supplied by Steward & Co during the year commencing November 1848. John Richardson was charged with stabbing Mr. Emms. The assault had occurred on the night of Friday 18th August 1848 and in court the following day it was heard that Mr. Emms was unable to attend court to give evidence, so the accused was remanded to the next session. On Wednesday 23rd August it was heard that Mr. Emms had been stabbed in the leg whilst attempting to separate his ostler and Mr. Richardson who were fighting over a sixpence. Butcher Robinson pulled out a knife during the struggle and it was then that Mr. Emms was injured. The accused was put on bail and Committed for trial at the next Assizes. At the trial, held March 1849 it was revealed that Mr. Emms had received a wound to his hip, three-quarters of an inch long and a quarter of an inch deep. Pleading drunkenness and with the report of good character from several witnesses, Richardson was found guilty of an assault only and sentenced to two months' imprisonment. 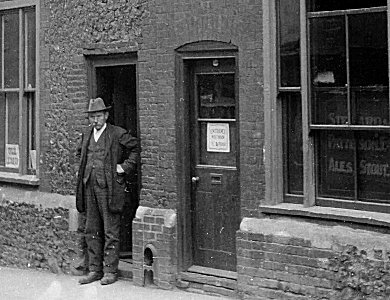 At the petty Sessions Wednesday 16th March 1859, William Emms was charged with having his house open for the sale of beer at half past eleven on the morning of the previous Sunday. Sergeant Smith said he had visited the house on three occasions that morning and each time found evidence of beer having been drunk. Mr. Emms said that the persons present were lodgers and made use of some very abusive and disgusting language to the sergeant. A fine of 20s and 11s 6d costs was inflicted for the breach of the beer act and Mr. Emms was ordered to enter in his own recognizance's of £10 and to find two sureties of £10 each to answer for his good behaviour for the next three months. At the Annual Licensing Meeting on Tuesday 30th August 1859 it was heard that William Emms had been fined 20s for selling beer at illegal hours and bound over to keep the peace towards police-sergeant Smith since he had abused and insulted the policeman in the presence of the magistrates, after the case. The licence was renewed on condition that owners Steward & Patteson put in a respectable tenant in place of Mr. Emms. Mr Emms took over the WHITE HART immediately after leaving this house (c1860). In Court Wednesday 16th October 1867, when successfully appealing against loss of licence at that house, it was heard that a man named Seago regularly used the STAR & CROWN and Mr. Emms had never seen him drunk. Mr. Seago had however committed suicide and owed fifteen guineas for drink supplied over six years. A bill had been sent to his widow. Provisional order of licence removal made 09.02.1932. Licence transferred to the PARK HOUSE in 1933 and the house was sold 1934.